Stacked up against other states, Texas public schools could win the best-bang-for-your-buck competition. The state has consistently ranked among the bottom five nationally in per-student spending. And even with a growing population of economically disadvantaged and English-language learning students, some academic performance measures are on the upswing. Gov. Rick Perry and other state officials have attributed this low-cost, higher-than-average performance to a combination of tough standards and accountability policies. But the commitment to fiscal restraint has come with its own burdens for the teachers responsible for educating the state’s future workforce. Despite having a starting salary that is on par with other states, the average teacher in Texas makes about $49,000 a year — about $8,000 below the national average. Teacher pay in Texas ranked 30th in the nation during the 2010-11 school year, dropping to 35th two years later, according to an annual state-by-state analysis by the National Education Association. Reports conducted on a smaller scale reveal additional financial strains on the state’s teachers. A study released by Sam Houston State University in October that was commissioned by the Texas State Teachers Association showed a marked increase in teachers reporting that they had taken second jobs during the school year to make ends meet. The same report also showed teachers increasingly spending their own money on school supplies. In 2013, teachers said they spent an average of $697 on school supplies, a $130 increase over 2010. The trouble for Texas teachers does not end there. 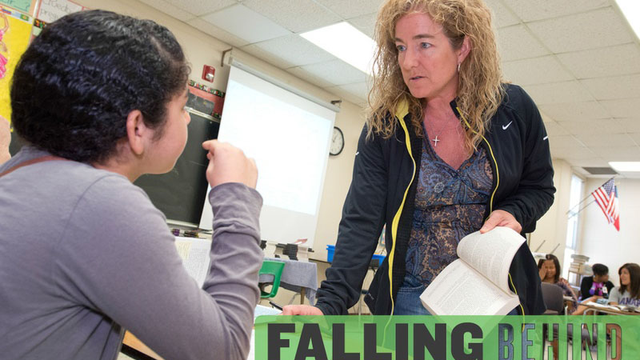 Despite a boom in alternative certification programs promising a fast track to teaching, the state faces a chronic — and growing — shortage of certified teachers in middle school math and science. In those subjects, according to Texas Education Agency data, 32 percent of educators are teaching outside their field. The figures for English-language learning programs, in which the number of students has grown 25 percent in a decade, are even higher. Across all grades, 41 percent of the teachers assigned to those programs are not certified. Since 2005, Texas has dropped from 36th to 47th in per-student spending. In the 2012-13 school year, the state’s budget allowed for $8,200 a student, which was higher than only Arizona, Indiana, Oklahoma and Utah — and below the national average of $10,200. Even with the spending decline, Texas has seen some gains in student achievement. The rate of students graduating from high school on time and attending college has increased in the last decade. On national standardized tests, Texas students have earned steadily higher scores, in some instances beating the national average. The percentage of students, especially African-Americans and Hispanics, enrolled in Advanced Placement courses and taking college entrance exams like the SAT has soared. But there are also signs that the educational improvements state leaders tout might not last. In 2013, for the first time in 15 years, math and reading scores went down or stayed the same for African-American and Hispanic students in both fourth and eighth grade on the National Assessment of Educational Progress, a standardized exam that measures reading and math skills in fourth, eighth and 12th grades. Scores also went down for white students in some areas. Performance on the SAT, the college admission exam, has also dropped. Since 2005, Texas students’ SAT scores have decreased by 8 points in reading and 6 points in math. ACT scores have shown an incremental improvement from 20.1 in 2004 to 20.9 in 2013. Julian Vasquez Heilig, an education researcher and professor at the University of Texas at Austin, said the achievement of Texas students would continue to drop if the state does not prioritize school funding. “The real issue is that we need to decide if we want a Cadillac education or a Kia education,” he said. That question is at the center of a school finance lawsuit pitting Texas school districts against the state. The fight is over the consequences of lawmakers’ $5.4 billion budget cut to public education during the 2011 legislative session. Months later, Texas public schools opened their doors without state funding to account for growing student enrollment — something that had not happened since the modernization of the state’s public education system more than 60 years prior. There was an immediate effect on teachers, from those who lost their jobs to those who lost faith in the system. For the first time in a decade, the number of teachers employed by the state’s public schools declined, with the attrition rate jumping from 8.9 percent in 2010 to 10.5 percent in 2011. The number of elementary school classes with waivers to exceed the state’s 22-student cap soared to 8,479 from 2,238 the year before. During the 2013 legislative session, lawmakers restored about $3.4 billion they had previously cut. While the number of teachers has not returned to what it was before 2011 — and the number of students has increased by about 5 percent since — the state’s teaching corps has been growing. And the number of class-size waivers, while still above 2010 levels, has dropped significantly from the high it reached during the 2011- 2012 school year. The increase in funding should be classified as “temporary at best,” said Rick Gray, a lawyer representing a group of school districts as he argued their lawsuit against the state in January. Disclosure: The University of Texas at Austin and Sam Houston State University are corporate sponsors of The Texas Tribune. A complete list of Texas Tribune donors and sponsors can be viewed here.